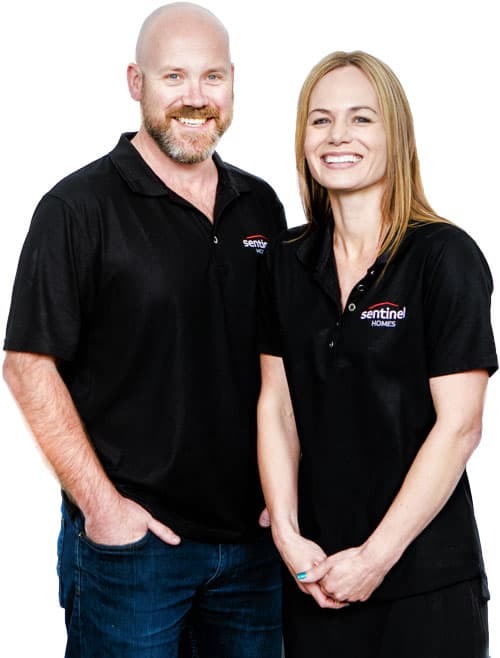 Hayden and Kylie Rau are a husband and wife team who operate the Wellington and Kapiti Coast Sentinel Homes franchise areas. Hayden spent ten years with the police force in Auckland and Wellington before becoming involved in the building industry. The catalyst for this was the need for a new family home for Kylie and himself and a growing family. For the last 13 years Hayden has developed an in-depth knowledge of the many different aspects of the building industry. From working in sales, design, marketing, project and branch management with group builders, along with area management for a multinational manufacturer of cladding systems this has given Hayden well-rounded skills for managing his own franchised building business. Kylie has previously worked in business banking with Westpac, and the District Court as a registrar. For the last eight years Kylie has been an embalmer/funeral director for a local family owned funeral home, a job where no two days are the same. One of the main reasons Hayden and Kylie enjoy building homes for people is clearly remembering the feeling they had when building their own new home, the excitement they felt throughout the process, and the sense of achievement and satisfaction once their home was complete. Hayden and Kylie would welcome your enquiry!